In one of my Beginner Program courses, I take a group of students to a local wildlife park so they can practice their newly reclaimed telepathic ability with the animals there. 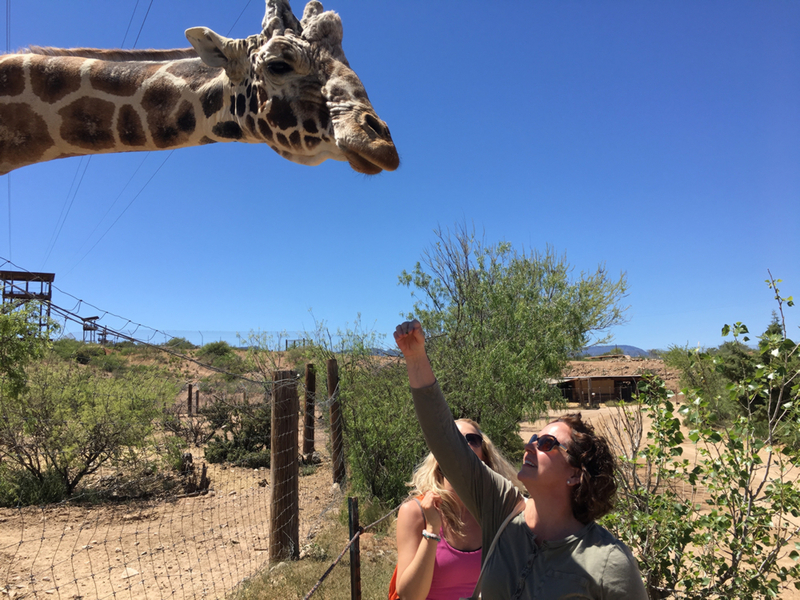 In a recent class, a giraffe named Pilgrim licked two of my students on the face—big kisses of gratitude for their open-hearted listening and compassion. We had been standing at the side of his enclosure for about 30 minutes, just being present and listening to him share about his life. His heart was heavy about a variety of things (it’s not easy being a giraffe in captivity, even though this place is top notch). Then after a while he turned around and walked back into the distance when he felt the conversation was complete. We weren’t sure why, but it felt important to stay there and let him know we were still there if he wanted to share more. It was as if our sticking around showed him that we really cared. 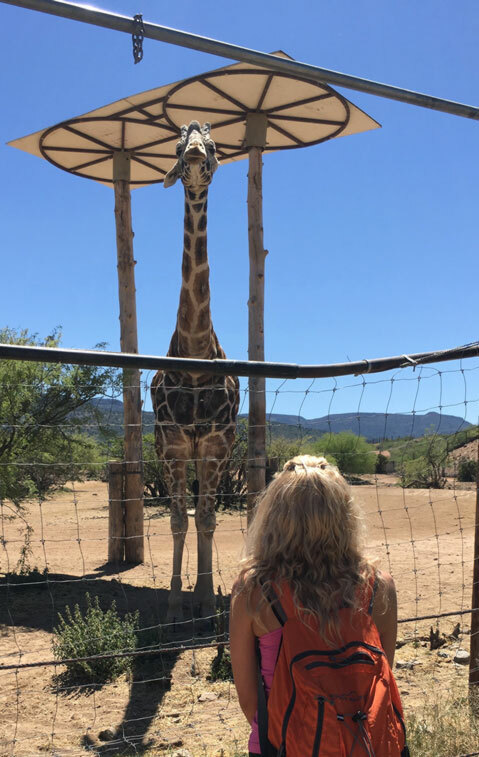 So then he made his way back over to the fence, where he promptly reached down and gave a big wet messy giraffe kiss on the face to two of my students, Dianne and Connie. It was so clear that he was grateful to have some people there who could understand his experience deeply, and who showed him that they care. 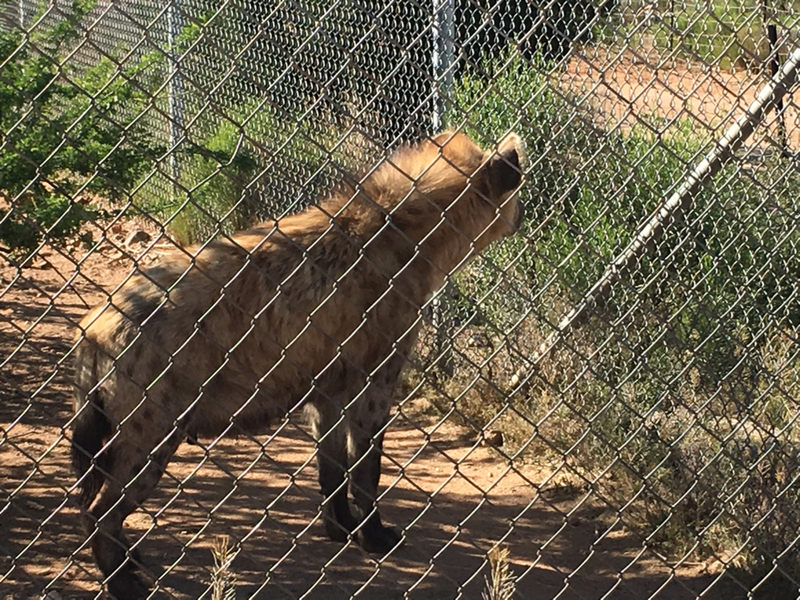 On that same visit, a hyena named Chipa purposefully came out of her nap time to meet us. She knew that we could communicate with animals and she said she had a message she wanted to share. Have you ever seen a hyena up close? Their jaws are huge and their predatory power and intensity are so palpable. The staff has told us that they are the only animals at the park who actually still bite the handlers there. Then she turned and walked back to her den to continue with her day. Another giraffe, Kibo, is quite out-going. He always comes over to the fence to say hi, right up to the edge so my students and I can touch his nose. But last time, he did something really astonishing. We were all standing there being present with him and listening to him share about his life, then he told me that he wanted to talk only to one of my students, Randi, a woman from Canada. I told her this, and then he promptly turned toward her and looked her straight in the eyes, for about 3 or 4 minutes. Neither of them moved. We could all tell there was a profound connection happening, and something beautiful passed between them in the silence. Then it got even more amazing. He turned to another student, and did the same, for about 4 minutes or so. Then he turned to ME, and I responded to him telepathically, “I am the teacher here, it’s ok, you can help my students instead.” But Kibo disagreed. And so he held eye contact with me, too. For several minutes I felt a warmth build in my heart—literally. It felt healing. And one by one, he connected with each of my students in this way. About the time he was with the last student, a bus from the park drove up in the area inside his enclosure. It was full of children, with a park guide on a bull-horn, and they had carrots dangling out of the window. But Kibo didn’t move. He stayed with us for another couple of minutes, while the park employee was loudly calling him over, and puzzling over why he wasn’t coming. At last, he said goodbye to our group, and dutifully turned and walked toward the bus with the man with the bull-horn and the children with carrots. We could all feel his fatigue, and his sadness to leave the connection with the people who were so fully present with him. 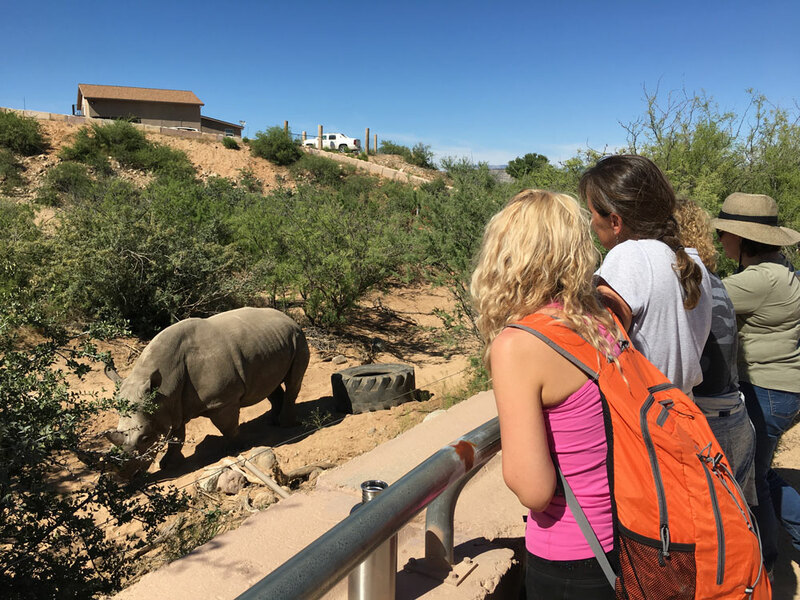 Every time I take a group to the wildlife park, he shows every student how he longs for a family—a mate, little babies, brothers and sisters, friends of his own species. He shows us a memory of being in the wild with others of his species. Flashes of being a little baby rhinoceros in the wild, and he was all alone, knowing something had happened to his mother. And then being sold into human captivity. But there are some factual problems with his story. First of all, Jericho was born into captivity, so he has never known what it is like to live in the wild with his own kind, nor to be captured and sold into captivity. Second, scientists tell us that rhinoceroses are not herd animals, they are solitary beings, and very territorial, especially the males. 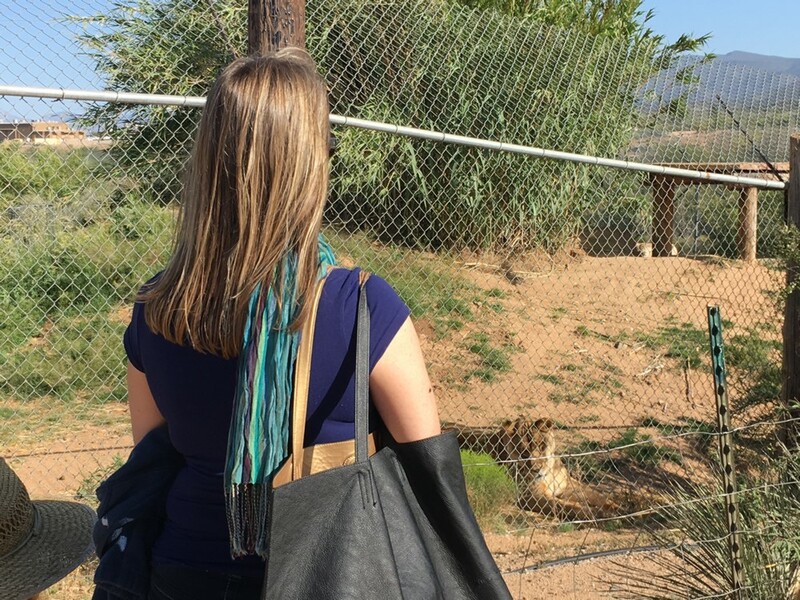 So why would Jericho show my students the same longing for family, and the same story of torture and betrayal by humans, over and over again now, for over 4 years of visiting the wildlife park? As an animal telepath, I don’t sit around and come up with theories. When I want to know something, I ask an animal. So I asked Jericho. He said that he knows what is happening with his kind. He knows that his species is going extinct. How is this possible? Jericho feels the truth of his species’ situation in his cells, in his DNA, from his connection to the rhinoceros collective unconscious, even from his own past life memories, and from his own capacity to telepathically perceive what is happening with other rhinos in other parts of the world (animals do this, it is not uncommon). And it is making him insane with grief. The staff at the park confirmed that he came to them from Bush Gardens, in Florida, where he was causing problems because of destructive fits of rage. The owners of his current wildlife park purchased him to try to give him a better life. Jericho has told us that he likes this home better; the humans try to understand him more. And his environment is calmer, and he likes that. 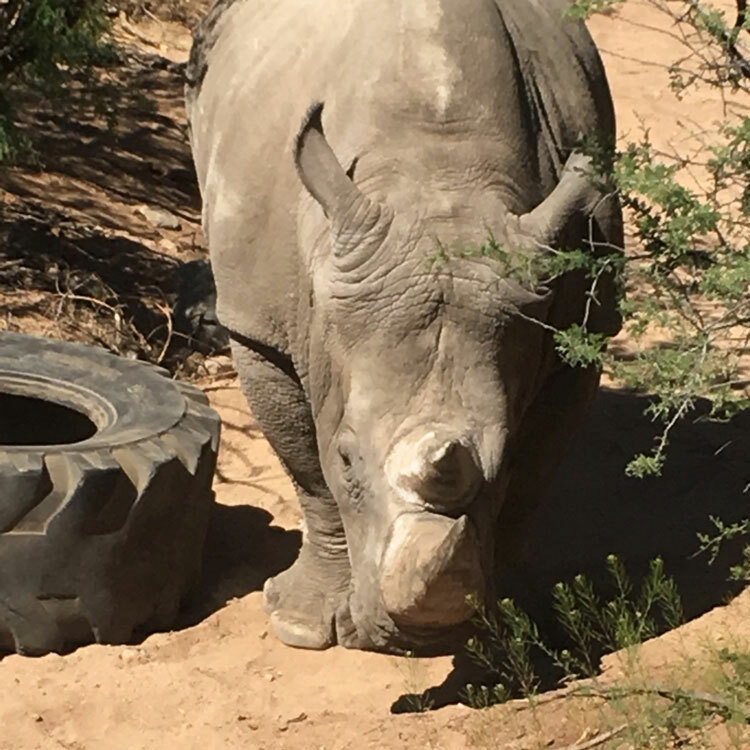 But he is still deeply lonely for his family, for connection with other rhinos and a normal life in the wild. The last time I visited Jericho with my group of students, he was sitting out in the open, within view of the fence, waiting for us. We gathered up to the edge and extended our hearts to him, opening up to feel his experience. He shared again his longing, and his knowing that what he wants will never happen for him. 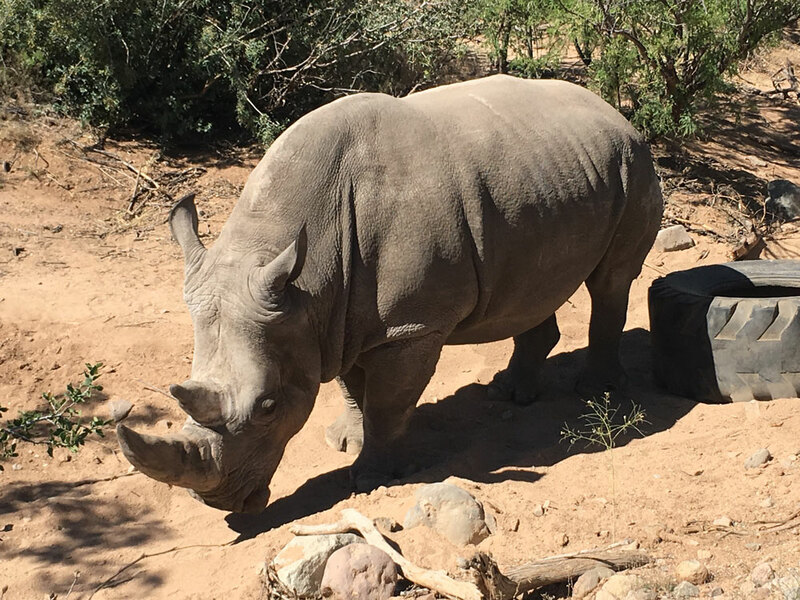 We asked if having another rhinoceros here, at the wildlife park, would help. He said maybe. He then showed us images of rhinoceroses in the wild. And a sense of pride in his species. Their beauty and strength, their devotedness to each other. Several of us were tearing up at this point, and honestly, I am again as I write this. At that point, I knew that something needed to shift. I asked each of my students to speak out loud a message to Jericho. He needed to feel our support. He needed to hear that we understand and that we are concerned for him and for his species. And immediately after the last one of us shared, much to our surprise, Jericho got up. He looked up at us. He seemed lighter. He walked around. 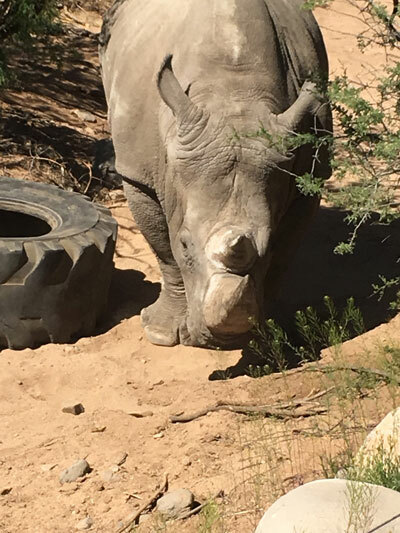 He even took his horn and moved the giant tire-toy in his enclosure, that he had been lying next to. Feeling a tiny ray of hope again, he walked along into the brush. We followed along the edge of the enclosure for as long as we could see him, still sending him our love and our concern for him. His gratitude was so obvious; he seemed to have a spring in his step now. After a few minutes he disappeared into the foliage. Not all of the animals at the park are sad. Yes, it is hard for them to live an artificial life in captivity, where many of their natural wants and needs must be put aside. Some of them have a harder time of this than others. But they understand that they are sacrificing a life in the wild to entertain and educate humans. Some of them have shared that they feel this is an important mission, and their sacrifice can help all animals on the planet. Kumba is one such being. She is a lioness at the park, and last year in one of my courses, she came up to the edge of her enclosure and sat down to have a really long conversation with me. All the while my students just listened, and held the space as I translated what she shared. Kumba said she oversees things here at the wildlife park, she is one of the animals who is in charge. She sends out news to all the other animals telepathically, and helps them understand why they are here, what their purpose is here. Kumba showed me a deep understanding that this life in captivity is not easy for many animals. But they are cared for and have an important mission, and this is what matters. She said she understands me, and what I am doing. She said she wants to help me understand about how to hold true power, and that I should consider her a lifelong friend. She said my “cubs” (read: my students) hold promise, and that there will be many more of them. About this time, a child in the distance let out a big shriek. Kumba sent me the thought, “I really can’t stand human children.” And then the lioness continued on, showing me ways that I can improve myself as a leader-being. But then the child and her mother, seeing Kumba up so close to the fence, came right over to see her. After about 10 seconds, Kumba turned her head to the child and let out a roar/snarl/bark noise that made us all jump a little. The little girl said something like, “What does that mean, mommy?” And not wasting any time, the mother took her daughter’s hand and said, “This lioness doesn’t want us here,” and moved on. My students and I were amazed, taking in this whole experience. Not only had this lioness shared some powerful messages for me, but she just then demonstrated for us all the very thing she had communicated telepathically just moments ago. Since that communication, I always check in now telepathically with Kumba before I take students to the park. I ask her how we can be of most service to the animals there, and which animals can really benefit from our communication with them. And she always gives us a list, and these animals are always expecting us when we arrive. It is so amazing and beautiful. We share this planet with other nations of beings—not just whales and lions and zebras, but Pitt Bulls and feral cats and factory farm pigs. They are all unique living beings, with their own perspectives, and deserve to be understood. Animals are going extinct on our planet now at a faster rate than any time in history since the dinosaurs. Now more than ever, communicating with animals is important work. But we humans have forgotten how to speak the universal language of telepathy that unites us all. We have so much to learn from animals. We need to understand their experience, we need to extend our compassion to them, and we need to allow them to heal us. And more than anything, we need to help our fellow humans value other animals’ right to exist on this beautiful planet, as much as we value our own right to be here. Please join me in this movement, and learn how to reawaken your own telepathic ability, so that you can be one of the humans who understands animals’ perspectives and translates for the rest of humanity, just what is at stake. This work can heal us all, as it will open us up into the larger fabric of love that connects all living things.